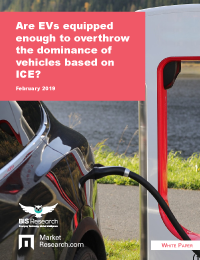 Are EVs equipped enough to overthrow the dominance of vehicles based on ICE? Will electric cars take over? If so, when? These questions are top of mind for industry players, investors, and consumers alike who follow the latest auto trends. Given the huge investments in electric vehicle technology and ambitious targets set by OEMs and governments around the world to accelerate the adoption of EVs, it seems very likely that ICE technology is on the way out, according to a newly released white paper by BIS Research, a market intelligence firm focused on emerging technology. With concise analysis and eye-catching graphics, this white paper is an essential guide to the future of electric vehicles. Get your copy today.